A plant is any organism in the kingdom Plantae. Kingdoms are the main divisions into which scientists classify all living things on Earth. The other kingdoms are: Monera (single-celled organisms without nuclei), Protista (single-celled organisms with a nucleus), Fungi, and Animalia (animals). The scientific study of plants is called botany. A general definition of a plant is any organism that contains chlorophyll (a green pigment contained in a specialized cell called a chloroplast) and can manufacture its own food. Another characteristic of plants is that their rigid cell walls are composed mainly of cellulose, a complex carbohydrate that is insoluble (cannot be dissolved) in water. Because of the vast number of plants that exist, cellulose is the most abundant organic compound on Earth. Biologists have identified about 500,000 species of plants, although there are many undiscovered species, especially in tropical rain forests. Those plants that produce seeds are the dominant and most studied group of plants on the planet. The leaves of these plants are all covered with a cuticle, a waxy layer that inhibits water loss. The leaves have stomata, microscopic pores, that open during the day to take in carbon dioxide and release oxygen during photosynthesis (process by which sunlight is used to form carbohydrates from carbon dioxide and water, releasing oxygen as a by-product). Chlorophyll: Green pigment found in chloroplasts that absorbs sunlight, providing the energy used in photosynthesis. Chloroplasts: Small structures in plant cells that contain chlorophyll and in which the process of photosynthesis takes place. Meristem: Special plant tissues that contain actively growing and dividing cells. Photosynthesis: Process by which sunlight is used by plants to form carbohydrates from carbon dioxide and water, releasing oxygen as a by-product. Stomata: Pores in the surface of leaves. Leaves are connected to the stem by veins, which transport water and nutrients throughout the plant. There are two special types of cells in this vascular system (the vessels that carry water and nutrients): xylem and phloem. Xylem (pronounced ZEYE-lem) are mainly responsible for the movement of water and minerals from the roots to the stems and leaves. Phloem (pronounced FLOW-em) are mainly responsible for the transport of food, principally carbohydrates produced by photosynthesis, from the leaves throughout the plant. The vascular system of plants differs from the circulatory system of animals in that water (in the form of vapor) evaporates out of a plant's stomata (a process called transpiration), whereas an animal's blood is recirculated throughout the body. The roots of a plant take up water and minerals from the soil, and also anchor the plant. Most plants have a dense, fibrous network of roots, and this provides a large surface area for the uptake of water and minerals. As a plant grows, it undergoes developmental changes. Most plants continually produce new sets of organs, such as leaves, flowers, and fruits. In contrast, animals typically develop their organs only once and these organs merely increase in size as the animal grows. A plant begins its life as a seed. Various environmental cues such as sunlight, temperature changes, and the presence of nutrients signal a seed to germinate (grow). During early germination, the young seedling depends upon nutrients stored within the seed itself for growth. As the seedling grows, it begins to produce chlorophyll and turn green. 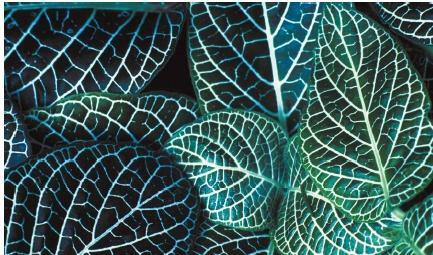 Most plants become green only when exposed to sunlight because the production of chlorophyll is light-induced. meristem is a special tissue that contains actively growing and dividing cells. Apical meristems are at the tips of shoots and roots and are responsible for elongation of a plant. Lateral meristems are located along the outer sides of the stem of a plant and are responsible for thickening of the plant. Plant diseases can be infectious (transmitted from plant to plant) or noninfectious. Noninfectious diseases are usually referred to as disorders. Common plant disorders are caused by a shortage of plant nutrients, by waterlogged or polluted soil, and by polluted air. Too little (or too much) water or improper nutrition can cause plants to grow poorly. Plants can also be stressed by weather that is too hot or too cold, by too little or too much light, and by heavy winds. Pollution from automobiles and industry and the excessive use of herbicides (to kill weeds) can also cause noninfectious plant disorders. Infectious plant diseases are caused by living microorganisms that infect a plant and rob it of nutrients. Bacteria, fungi, and viruses are the living agents that cause plant diseases. None of these microorganisms are visible to the naked eye, but the diseases they cause can be detected by the symptoms of wilting, yellowing, stunting, and abnormal growth patterns. Some plant diseases are caused by rod-shaped bacteria. The bacteria enter the plant through natural openings, like the stomata of the leaves, or through wounds in the plant tissue. Once inside, the bacteria plug up the plant's vascular system and cause the plant to wilt. Other common symptoms of bacterial disease include rotting and swollen plant tissues. Bacteria can be spread by water, insects, infected soil, or contaminated tools. About 80 percent of plant diseases can be traced to fungi, which can grow on living or dead plant tissue. They can penetrate plant tissue or grow on the plant's surface. Fungal spores, which act like seeds, are spread by wind, water, soil, and animals to other plants. Warm, humid conditions promote fungal growth. Viruses are the hardest pathogens (disease-causing organisms) to control. Destroying the infected plants to prevent spreading to healthy plants is usually the best control method. While more than 300 plant viruses have been identified, new strains continually appear because these organisms are capable of mutating (changing their genetic makeup). 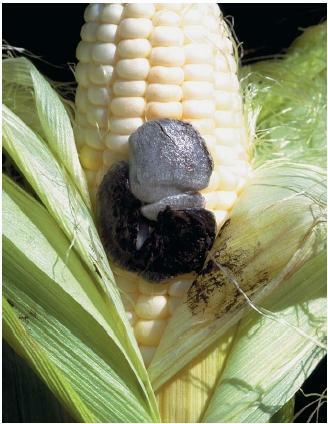 Viruses are spread by contaminated seeds and sucking insects (aphids, leafhoppers, thrips) that act as carriers of the virus. The symptoms of viral infection include yellowing, stunted growth in some part of the plant. Leaf rolls and narrow leaf growth are other indications of viral infection. The mosaic viruses can infect many plants. Plants infected with this virus have mottled or streaked leaves. of pea plants. Over 100 years later, in late 2000, scientists from the United States, Europe, and Japan determined the first complete genetic sequence of a plant. Fellow scientists hailed the accomplishment, saying it would deepen understanding of plant biology and provide new ways to engineer crops genetically to increase food production and improve nutrition. The planet, commonly called thale cress, is a small weed that is related to the mustard plant. It is worthless as a crop. However, like a laboratory mouse, it is being studied for insights that can be applied to virtually all other plants. As a matter of fact, scientists are testing genes found in the plant to make other plants flower more quickly, to keep fruits from ripening too early, and to produce healthier vegetable oils. Scientists have already identified 100 genes in the thale cress that can be used to design new herbicides. great website for children needing to look up plants for homework.